There’s lots of ways to herb crust a roast. 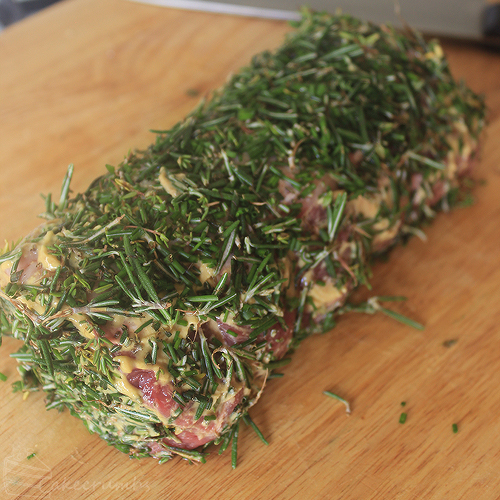 One of my go-to [read: lazy] methods is to cover the meat in dijon mustard, then cover that with whichever of the herbs in my garden looks like it could do with a prune. In this case I went for rosemary, thyme and chives. How long you roast it is going to depend on your preference. We love our meat medium rare, so it takes a bit under an hour. It’s right when the internal temperature reaches about 60°C. If you like your meat well done, you’ll be wanting closer to 70°C. Since it’s still warm we weren’t quite ready for roast veggies just yet, but a tater salad fit the bill just perfectly. There’ll be no recipe to follow for this side dish, but it’s so easy you don’t need one. Just quarter and boil washed potatoes in their skins until tender, then add your favourites. 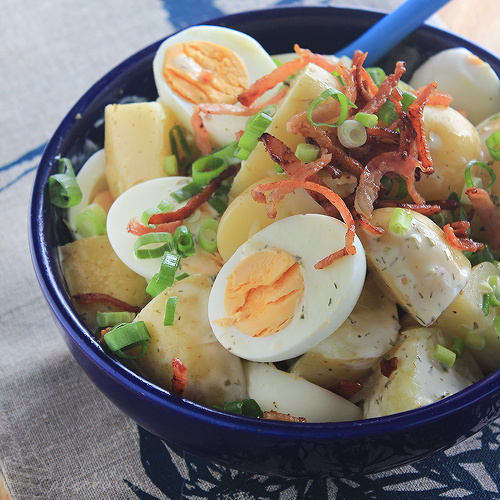 I can’t say no to hard boiled eggs, some bacon and spring onion. I make the dressing from mayonnaise and, again, whatever is around at the time. This time I added a squirt of lemon juice, dijon mustard, Italian salad dressing and dill leaf tips. We took our meals to the setting outside and relished being able to enjoy the outdoors for once. 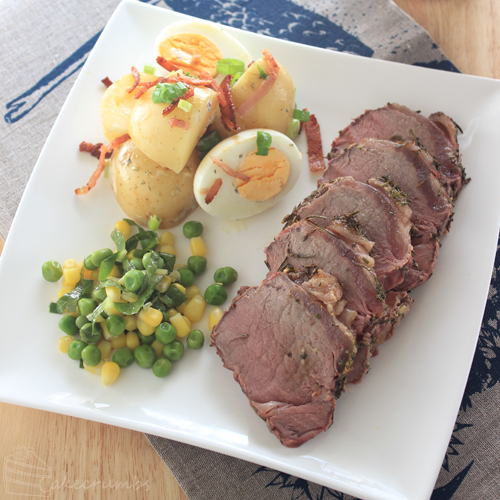 Maybe we were just missing having proper home-cooked meals, or maybe it really just did taste amazing, but we could not get enough of this dish. 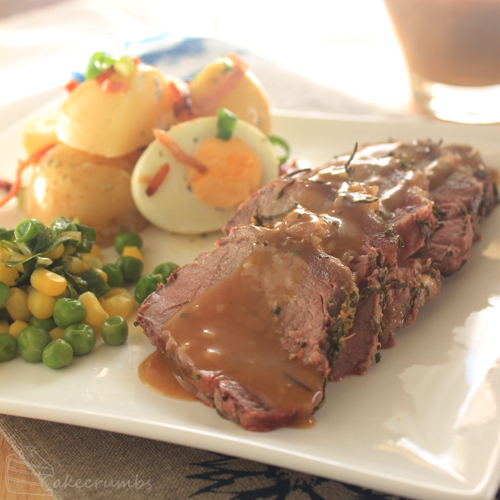 The gravy is completely optional, but we never feel a roast is complete without it. When it comes to savoury recipes I’m fairly terrible at translating my methods to text. I don’t really measure anything and my methods can differ every single time. So know the following recipe is not gospel and don’t worry about getting exact quantities. There’s no need for it. Most everything (except perhaps the cooking time) is completely open to interpretation. *NB: as this is a small roast, it is likely that the juices released during roasting will dry up on the bottom of the pan. You can pour a little boiling water over them to rehydrate it. To prepare meat, rub all over with salt and pepper. 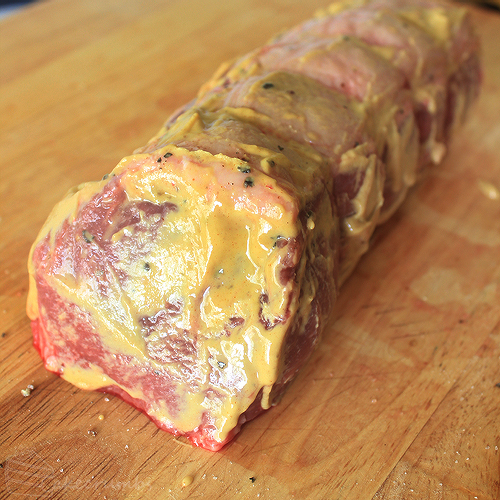 Spread dijon mustard over the surface of the beef, then cover with fresh herbs. 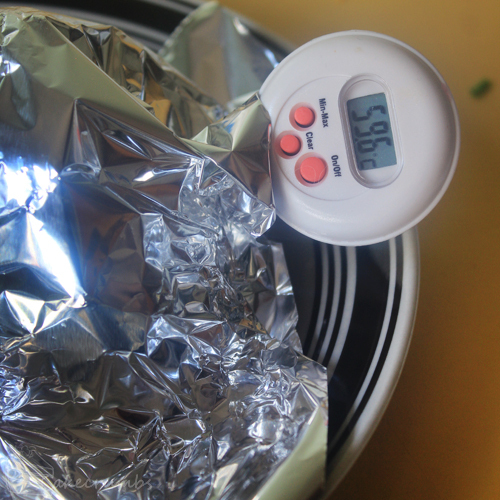 Remove roast from the oven, place on a dish and cover with al foil to rest for 5 minutes, or while you prepare the gravy. When ready, remove any kitchen twine or netting from the roast; carve and serve. Make a roux by combining 2tbsp of the pan juices with 2 tbsp of plain flour in a small saucepan; cook over medium heat until it forms a thick paste. Reduce heat to low. Gradually stir in the rest of the pan juices and the beef stock, stirring continuously. 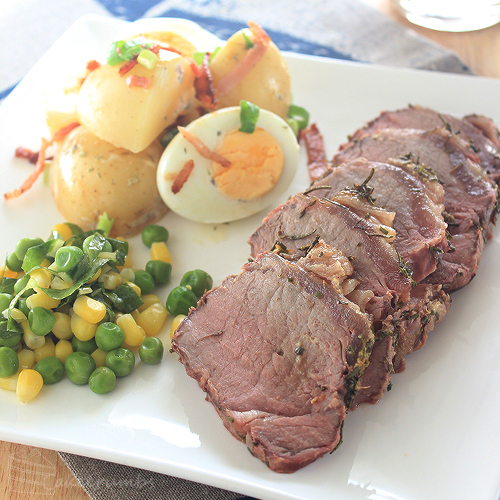 As your roast is resting it will release more juices, so feel free to add those in as well. Bring mixture to the boil, then reduce again to a simmer. Cook until the sauce is reduced to your ideal thickness. Season to taste with salt and pepper. I too am thoroughly glad to not be checking the weather forecast before doing the grocery shopping. Bring on the roasts, apple pies and sticky date puddings! Oh, and gravy, its been months since we’ve had gravy! Oh my, I could definitely go an apple pie right now! How wonderful autumn will be! By the way, the part where you said you were unable to turn on your oven for fear of making your house too hot was really funny 😛 I sometimes feel that way, too. Y’know, it’s endlessly flattering to be referred to as a trusted source! So thank you for that, it is such a high compliment.